The Alberta Energy Regulator (AER) ensures the safe, efficient, orderly, and environmentally responsible development of hydrocarbon resources over their entire life cycle. As part of this mandate, one of the AER’s key services is to provide credible information about Alberta’s energy resources that can be used for decision making. To this end, the AER issues a report every year that gives stakeholders independent and comprehensive information on the state of reserves and the supply and demand outlook for Alberta’s diverse energy resources: crude bitumen, crude oil, natural gas, natural gas liquids,1 sulphur, and coal. Hydrocarbon producers in Alberta experienced another challenging year in 2017 as crude oil and natural gas prices, while showing some improvement, remained relatively weak. However, weak commodity prices did not inhibit activity to the extent that they did in 2016 because producers were able to find cost savings and improve operating efficiencies, resulting in an increase in conventional oil and gas activity. Conventional oil and gas wells placed on production recovered in 2017, increasing by 68 per cent relative to 2016, with capital expenditures on conventional oil and gas increasing as a result, ending the year at a projected Cdn$19 billion. The increase in gas wells placed on production was enough to offset natural declines in existing production, and natural gas production increased slightly year over year. Crude oil production increased in the latter half of 2017 due to the increase in wells placed on production but not enough to offset weak activity in the previous two years, and production declined as a result. Despite an outage at Syncrude Canada Ltd.’s upgrader earlier in the year, total crude bitumen production was up 7 per cent in 2017 as production recovered following last year’s wildfires around Fort McMurray and some projects expanded. In 2017, Canadian natural gas producers pushed to protect their interests in traditional markets in eastern Canada. Producers signed up for a long-term fixed-toll service proposed by TransCanada Corporation (TransCanada), which would transport an additional 1.4 billion cubic feet per day of natural gas from Alberta to the Dawn storage hub in Ontario to supply the eastern Canadian market. The National Energy Board approved TransCanada’s proposal in September, and the toll service began in November. In the oil sands sector, Canadian companies increased their stake in the oil sands by purchasing assets from international companies looking to focus their activities in other regions. These transactions amounted to over Cdn$30 billion. The outlook for natural gas prices in this year’s forecast is more optimistic than last year’s because increases in liquefied natural gas (LNG) exports from the United States and pipeline exports to Mexico are starting to provide relief to an oversupplied North American market. Additional U.S. LNG export facilities are expected to be developed over the ten-year forecast period, allowing further access to international markets, resulting in the Henry Hub price—the North American benchmark price for natural gas—gradually strengthening to US$5.41 per million British thermal units (MMBtu) by 2027, up 24 per cent over last year’s forecast. The AECO-C price—the commonly referenced Alberta natural gas spot price—is expected to benefit from the strengthening Henry Hub price; however, the price differential is expected to widen in the short term due to a lack of export infrastructure that would allow the growing western Canadian supply to access new markets. After 2021, the differential is expected to narrow as a result of pipeline expansions connecting Alberta to additional markets and increased domestic demand due to greater fuel use in the oil sands and a change in fuel source from coal to gas for electricity generation. The forecast for the price of West Texas Intermediate (WTI)—the North American benchmark crude oil price—is similar to last year’s, with the exception that prices will remain lower for longer as inventories remain resilient, despite the decision by the Organization of the Petroleum Exporting Countries (OPEC) and other oil-producing countries to manage markets by restricting production, which was recently extended to include 2018. The price of WTI is expected to remain relatively low in 2018, averaging US$53.00 per barrel (bbl) but is projected to grow to US$84.47/bbl by the end of 2027. Despite the lower near-term price outlook, conventional crude oil production is forecast to increase as a result of efficiency gains that allow operators to increase production at a lower cost. The marketable bitumen forecast is up slightly from last year’s forecast as operators are anticipated to focus on expanding their operations and debottlenecking existing projects over the forecast period. The following highlights the prices, capital expenditures, and supply and demand outlook through 2027 (the forecast period) for Alberta’s hydrocarbons and provides a snapshot of the province’s reserves. Alberta has been and remains the largest producer of natural gas and oil in Canada. In 2017, Alberta produced 68 per cent of Canada’s natural gas and 81 per cent of Canada’s oil and equivalent.2 More than 60 per cent of Canada’s total oil and equivalent production was marketable bitumen. After two years of declining prices, the price of WTI light sweet crude oil increased in 2017, averaging US$50.95/bbl compared with US$43.40/bbl in 2016. The WTI price in the base price scenario is expected to increase in 2018, reaching US$53.00/bbl. The base price scenario assumes compliance with the OPEC agreement to manage markets and continued growth in U.S. production, keeping a ceiling on prices. The low price scenario of US$46.57/bbl in 2018 assumes noncompliance with the OPEC agreement to restrict production and stronger than anticipated production growth, primarily in the United States. The high price scenario of US$59.43/bbl assumes high compliance with the OPEC agreement and an increase in geopolitical tensions in the Middle East and Africa. Similar to forecasts from previous years, the resilience of U.S. shale oil production to low prices and the ability of shale oil producers to quickly bring on more production as crude oil prices improve are projected to cap any significant price rallies in both the base and low price scenarios in the short term. However, prices in the short term are projected to be highly volatile as supply-side disruptions and geopolitical tensions unsettle the markets. The WTI crude oil price is forecast to gradually strengthen to US$84.47/bbl by 2027 in the base price scenario, with prices in the low and high price scenarios reaching US$60.75/bbl and US$108.19/bbl, respectively. The low price scenario assumes strong global production growth, whereas in the high price scenario, new supply is forecast to be inadequate to offset declines in existing production. Natural gas prices increased in 2017 as increasing U.S. LNG and pipeline exports provided relief to an oversupplied North American market. The Henry Hub natural gas price increased to US$3.09/MMBtu in 2017 from US$2.41/MMBtu in 2016. In 2018, the base price is forecast to strengthen to US$3.26/MMBtu, reflecting increased U.S. LNG exports and growing U.S. pipeline exports to Mexico. In the low price scenario, the price is forecast to average US$2.82/MMBtu as a result of increased production and delayed development of LNG export facilities. In the high price scenario, the price is forecast to average US$3.70/MMBtu as exports increase faster than anticipated due to early completion of LNG export facilities. The Henry Hub natural gas price is forecast to gradually strengthen to US$5.41/MMBtu by 2027 in the base price scenario, reflecting increased demand through a combination of increasing U.S. LNG exports, increasing U.S. exports to Mexico, and slowing U.S. domestic gas production. In the low and high price scenarios, the price is expected to reach US$3.64/MMBtu and US$7.18/MMBtu, respectively. Implicit in all three price scenarios is that U.S. natural gas production will continue to grow, albeit at a more moderate pace later in the forecast period, emphasizing the need to develop export markets to balance the market. Following two consecutive years of declining investment, total capital expenditures in the conventional oil and gas and oil sands sectors increased by 26 per cent between 2016 and 2017, reaching Cdn$33.6 billion.3 This increase was driven primarily by an increase in conventional oil and gas drilling as producers pursued operating efficiencies that improved returns on their investments. Capital expenditures in conventional oil and gas are forecast to increase from an estimated Cdn$19.0 billion in 2017 to Cdn$19.4 billion in 2018 due to slightly stronger prices, the attractiveness of shorter payout times compared with the oil sands sector, and a continued focus on finding operating efficiencies. 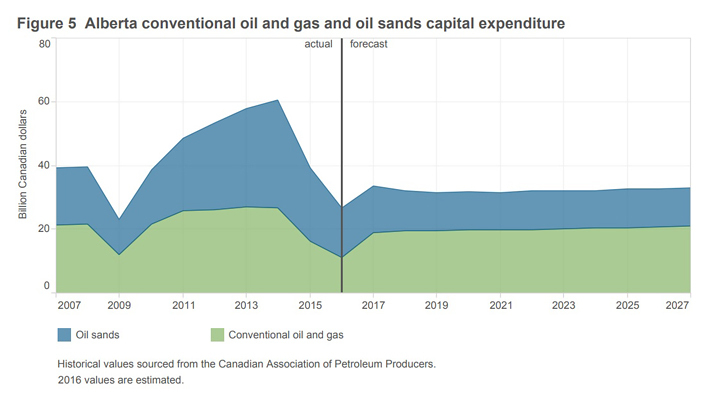 Conversely, oil sands capital expenditures are forecast to decrease from an estimated Cdn$14.6 billion in 2017 to Cdn$12.6 billion in 2018, reflecting the continued deferral of projects and the recent completion of the remaining capital-intensive mining projects. Capital expenditures in the oil sands are projected to be primarily focused on sustaining capital, debottlenecking, and expanding existing projects. For the remainder of the forecast period, capital expenditures are projected to moderately increase, with more capital expenditures assumed to be directed to the conventional oil and gas sector. The AER has been providing an independent appraisal of Alberta’s energy resources since 1961. The AER studies hydrocarbon extraction and ensures that energy resources under development are being optimized. The information is used by the Government of Alberta to develop policies and regional land-use plans and by the energy industry to evaluate investment opportunities in Alberta. Table 1 [HTML] provides the reserves determined for crude bitumen, crude oil, natural gas, natural gas liquids, and coal. 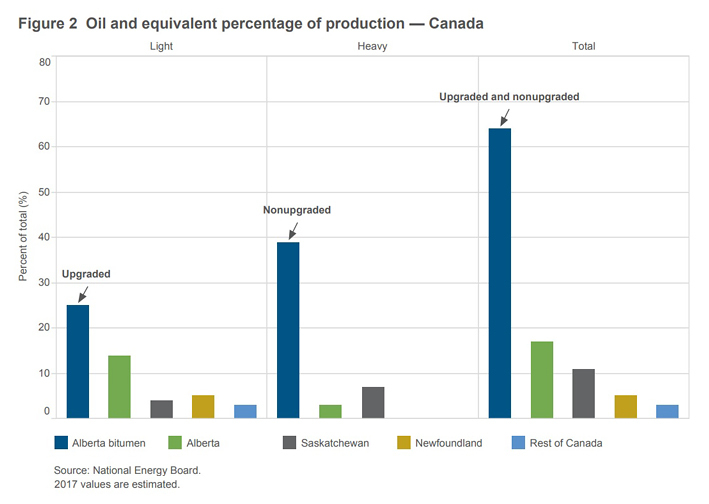 Following no increase in production in 2016, total primary energy4 produced in Alberta grew in 2017, primarily as a result of growth in the oil sands sector following a return to production after the Fort McMurray wildfires in 2016 and the addition of new phases at existing projects. Despite an increase in prices, conventional crude oil production declined slightly from 2016 because an increase in the number of wells placed on production was not enough to offset the previous two years of declining activity. Natural gas production increased slightly from 2016 as a result of an increase in the number of wells placed on production. In 2017, Alberta produced an estimated 12 952 petajoules (PJ) of energy from all sources, including renewable sources, or 5.80 million barrels per day of conventional light-medium quality crude oil equivalent (106 boe/d), a 3.4 per cent increase over 2016. In 2027, Alberta is projected to produce 14 842 PJ of energy from all sources, or 6.64 106 boe/d. Upgraded and nonupgraded bitumen production accounted for almost half of total primary energy production in 2017. This percentage is expected to increase to 60 per cent of all primary energy production in Alberta by 2027. In 2017, on the basis of energy content, conventional crude oil production decreased by an estimated 1.6 per cent, while total marketable natural gas production in Alberta remained flat. Total natural gas liquids production increased by an estimated 3.7 per cent in 2017 as companies focused on liquids-rich development. Total coal production decreased by an estimated 10.8 per cent due to suspended operations at some coal mines and lower coal demand for power generation. Following 2016, in which the Alberta supply of crude oil and equivalent decreased for the first time since 2008, production grew in 2017, reaching 3.3 million barrels per day (106 bbl/d). The increase is attributed to growth in supply of upgraded and nonupgraded bitumen and pentanes plus, which more than offset declines in conventional crude oil production. 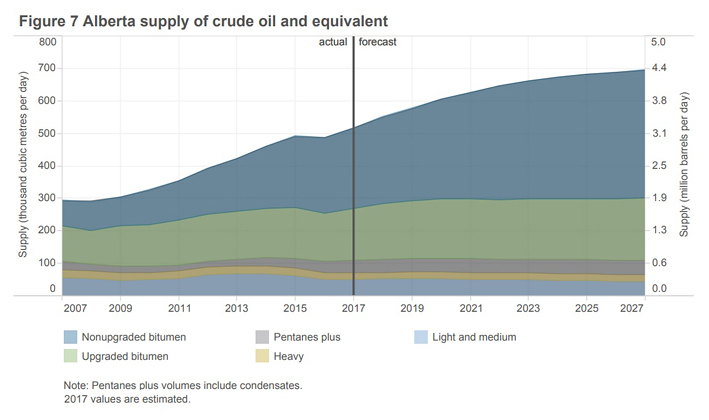 The Alberta supply of crude oil and equivalent is expected to continue to grow throughout the forecast period, driven primarily by growing upgraded and nonupgraded bitumen production, which is forecast to increase to 3.7 106 bbl/d by 2027. After declines in 2016 and 2017, conventional crude oil production is forecast to increase in 2018, reaching 0.4 106 bbl/d. Production is forecast to grow again in 2019 but then decline for the remainder of the forecast period because the number of wells placed on production is anticipated to be inadequate to offset the decline in existing production. Pentanes plus production is forecast to continue to grow through 2025, reaching 0.3 106 bbl/d, and then remain flat for the rest of the forecast period. In 2017, an estimated 43 per cent of produced raw bitumen was sent for upgrading in Alberta. However, without new upgrading projects planned, growth in in situ and mining production is expected to outpace additions to upgrading capacity at existing facilities, causing this percentage to shrink to 36 per cent by 2027. Upgraded bitumen output for 2017 was up 8.2 per cent as a result of recovery following the Fort McMurray wildfires and Phase 3 of Canadian Natural Resource Limited’s Horizon project becoming operational. Alberta primary energy demand for all fossil-based energy commodities increased by an estimated 6.0 per cent in 2017 relative to 2016. Total primary energy demand within the province in 2017 was estimated at 5482 PJ, equivalent to 2.46 106 bbl/d of crude oil. 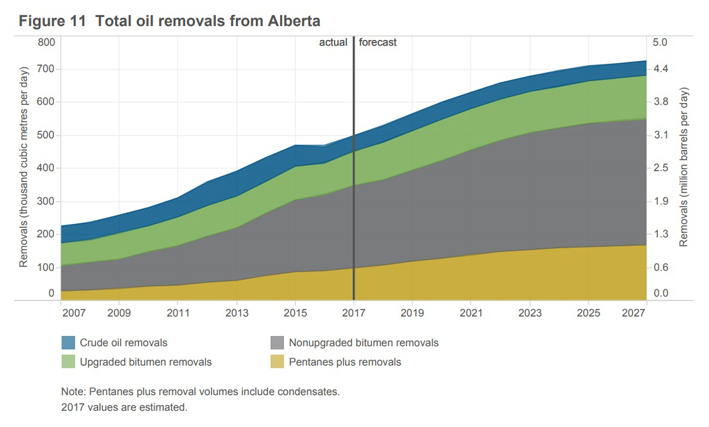 Alberta demand is projected to increase to about 6805 PJ, equivalent to 3.05 106 bbl/d, by 2027, largely as a result of strengthening demand for pentanes plus as a diluent in bitumen blending. However, moderate increases in natural gas demand are forecast, reflecting strengthened demand for natural gas for power generation. Small increases in bitumen demand are also forecast as a result of demand from the North West Redwater Partnership Sturgeon refinery. 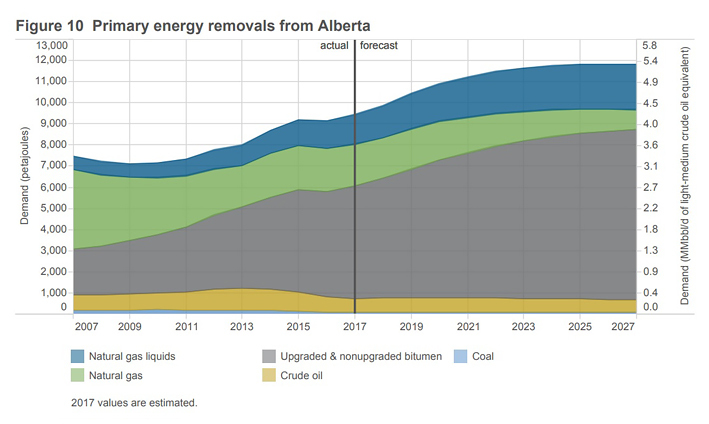 Primary energy removals from Alberta increased in 2017 by an estimated 3.1 per cent, primarily as a result of an increase in production of bitumen and associated need for pentanes plus for diluent, which increased removals of natural gas liquids. Total primary energy removals from the province in 2017 were estimated at 9450 PJ, equivalent to 4.23 106 bbl/d, with upgraded and nonupgraded bitumen representing over half of primary energy removals for the year. Removals from the province are projected to reach 11 829 PJ in 2027, or 5.30 106 bbl/d of crude oil equivalent, with upgraded and nonupgraded bitumen representing a growing share of primary energy removals. 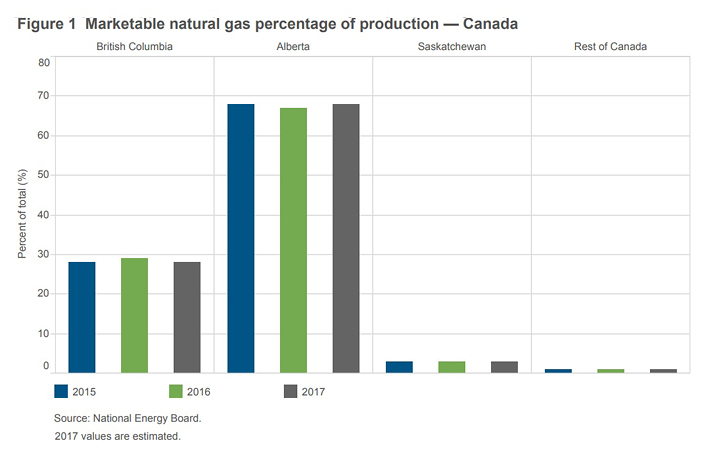 Despite a small increase in 2019, natural gas removals from Alberta are projected to decrease over the forecast period due to declining provincial production and increasing Alberta demand. In 2017, removals of conventional crude oil, pentanes plus, upgraded bitumen, and nonupgraded bitumen were an estimated 497.4 thousand cubic metres per day (103 m3/d) or 3.13 106 bbl/d. By 2027, 724.8 103 m3/d or 4.56 106 bbl/d of conventional crude oil, pentanes plus, upgraded bitumen, and nonupgraded bitumen are forecast to be removed from the province. This projection assumes that most of these removals will go to the United States and that there will be sufficient transportation capacity (pipeline and rail) to ship these volumes. Despite continued weak oil and natural gas prices, total drilling increased by 75 per cent in 2017 because producers were able to find cost savings and improve efficiencies. The forecasts are based on various assumptions about economic indicators. 1 Natural gas liquids refers to ethane, propane, butanes, and pentanes plus, or a combination of these, obtained from processing raw gas or condensate. 2 Oil and equivalent includes light, medium, heavy, and ultra-heavy crude oil; condensate (pentanes plus); and upgraded and nonupgraded bitumen (referred to as marketable bitumen). 3 Historical statistics obtained from the Canadian Association of Petroleum Producers’ Statistical Handbook (2016 data). Capital expenditures for 2016 are estimates. 4 The trends and growth rates may differ slightly when standard units of measure, such as cubic metres or tonnes, are compared. Various grades of energy commodities have different heating values, and any changes to their composition may yield slightly different numerical trends and growth rates.